Developing this recipe has been very difficult. And slow. And sometime a little discouraging. It often happens with gluten free cooking, you probably already know it. I have started to experiment with gluten-free flours sometime in 2011 and to try to make GF bread about 2 years later. In September 2013, I got the first bread that looked like something I would actually want to eat. It has taken me several more months to perfect it and it’s still a work in progress. Of course I don’t bake bread everyday. In addition, I am a small eater so each loaf lasts me several days as I am the only GF person in the house. But still, I must have made at least 20 different recipes to get to this point. You will probably say: “what’s the big deal? the internet is full of GF bread recipes, why don’t you make one of those? “. I know, I have obsessively read hundreds of gluten-free bread recipes. However, I was looking for a specific result, so please let me explain even if it’s going to be a bit long. 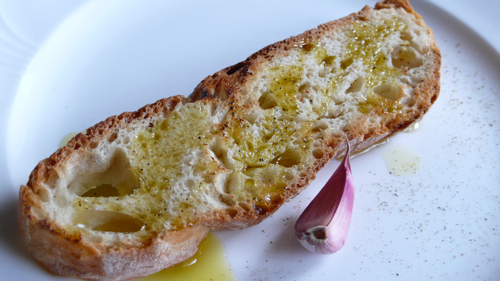 1) I wanted bruschetta bread, meaning an Umbrian style white loaf with a neutral taste, a crunchy crust and a relatively light and dry crumble. This type of bread is ideal not only to make bruschetta or crostini, but is a perfect accompaniment to Umbrian style appetizers of cured meats (like prosciutto or salami), frittata and pecorino or rubbed with garlic and doused with olive oil on top of a soup. I wanted bread that belongs to my food. 2) I wanted to make bread that works with different gluten-free flour mixes. Often recipes of GF mixes call for ingredients I can’t buy locally. Besides, if my mix has ingredients not available to you – who are probably living on the other side of the planet – you will not be able to reproduce it. 3) I wanted to make bread without eggs, nut flours and soy as they are allergenic. I use butter in this recipe but you can easily substitute it with vegetable shortening if you are intolerant or vegan. I wanted bread that could be modified according to people’s allergies. No corn? Use millet. No milk? Use water. 4) last but not least, I have been absolutely appalled by the incredible high amounts of yeast used in GF bread recipes. GF dough needs a little more yeast than a wheat based dough, but anyone who knows anything about bread making will tell you that over-yeasting is never a good idea. The bread is less digestible and definitely less palatable than the one made with small amounts of yeast and allowed to raise slowly at relatively low temperature. a) It’s all in the method. Most commercial GF flour mixes are based on variable amounts of cornstarch, rice flour, tapioca and potato starch. A mix is generally added with one or more thickening agents like xanthan, pectin, guar, psyllium or cellulose. After so many experiments, I think that with a bit of patience and method any gluten-free flour mix based on starches and seed flours can be used to make a reasonable bread. I think small amounts of bean flours might also work but I haven’t tested it. I have made this bread with different commercial gluten-free flour mixes. GF bread flour in Italy is added with guar and cellulose not with xanthan. Some mixes have milk some don’t but I don’t think this has an influence on the final result. I find that every mix has a different aftertaste so you might need to try a few to see which one you like better. I find that gluten free flour mixes with deglutinzed wheat starch taste best. I also find that every flour absorbs a different amount of water so you might need to adjust the final amount. If your dough is too dry the bread will not raise. If it’s too wet you will not be able to give it a shape. Don’t get discouraged by the first few experiments, GF baking is very different to wheat-based baking, you need to learn something completely new! 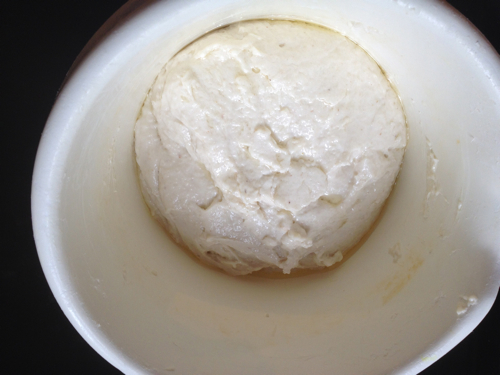 b) A pre-ferment also named poolish or Italian sponge is essential for a light bread. c) Adding steam to the oven while baking bread is the key to a high loaf with a crunchy crust. Cooking it in a pan will invariably produce a less crispy crust than a shaped loaf. Brushing with oil and milk also helps. d) butter in the dough helps achieving the desired texture, olive oil not so much. e) Making bread is very dependent on weather. If it’s cold and humid the preferment will take several hours to get to the “bubble stage”, so I make it overnight. In the middle of the summer I have it ready in one hour. During the rest of the year it will take 3-4 hours. You need to experiment with your own climate conditions, starting on weekends when you have more time. For example make the preferment in the morning, the bread dough in the afternoon and bake in the evening. This schedule works very well if it’s not extremely hot or cold or humid. After a while you will know the schedule for a certain time of the year and you will be able to easily fit it with other activities. 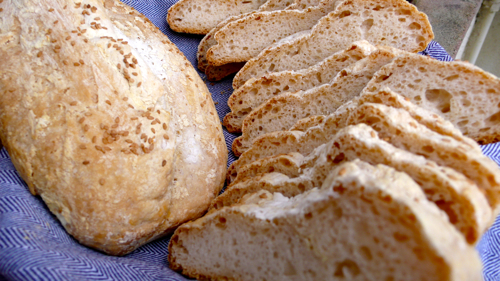 Accuracy is key to success with gluten-free bread, so you need to weight your ingredients. Please also weight the water or convert accurately. ** don’t use this recipe to develop a GF flour mixture, use a flour mixture that you know works for bread. *the corn meal is used to flavor the mix. I use a type of Italian cornmeal called “fumetto” wich is as fine as wheat flour. You can substitute it with any flour you like, e.g. buckwheat, chestnut, quinoa, sorghum, teff or simply more rice flour provided that it is very finely ground to avoid grittiness. 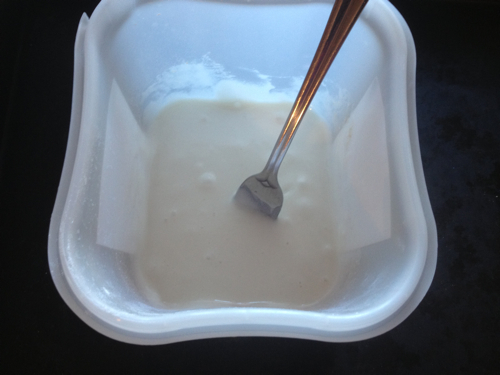 In a tupperware, mix 100 g (3.5 oz) of the GF flour mix with 100 ml (7 tab. water) water and 1 gr (1/4 teaspoon) yeast to make a thick batter. 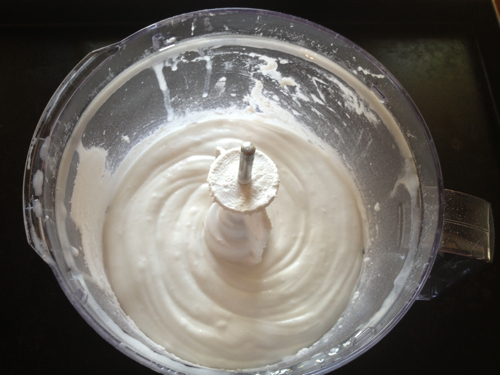 Add 1-2 tablespoon extra water if the mixture looks dry and clumpy. 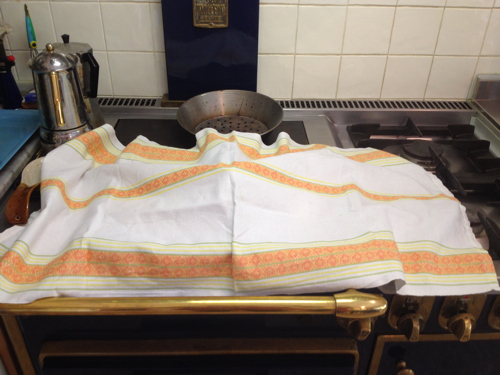 Cover, wrap in a tea towel and store in a draft free place. In the summer you can store it overnight in the refrigerator. For the rest of the year I keep it inside a kitchen cabinet or a switched off oven. 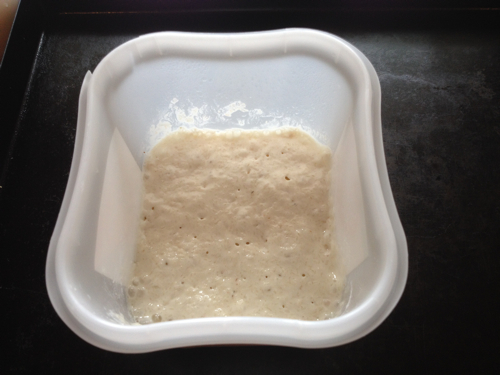 The poolish is ready when the surface is covered with small bubbles. When the poolish is ready, using a stand mixer or food processor, mix the GF flour and the cornmeal first with the psyllium and the softened butter then add all the poolish plus 2 gr (1/2 teaspoon) of the dry yeast and the salt. With the machine running at medium speed, start adding the water. GF flours absord incredible amounts of water. You want to obtain a really sticky dough and you might need more than 310 ml, it depends on the flour you are using. 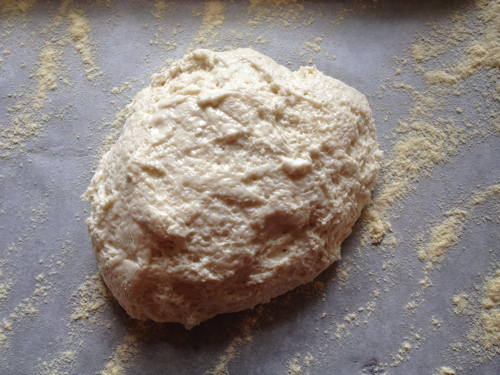 If the dough forms a ball, add more water as it will be too dry to raise, particularly if it’s winter. Using a spatula transfer the dough into an oiled bowl, cover with plastic wrap then with a tea towel and put it in a draft free place to raise. Line a cookie sheet with parchment paper and flour it well. For a golden crust, use polenta flour. Using a wet spatula, place the dough on the paper, cut it into 2 or 3 loaves and roll it very carefully in the flour to give them shape. Don’t knead the dough as it might deflate. Place the dough on floured parchment paper. 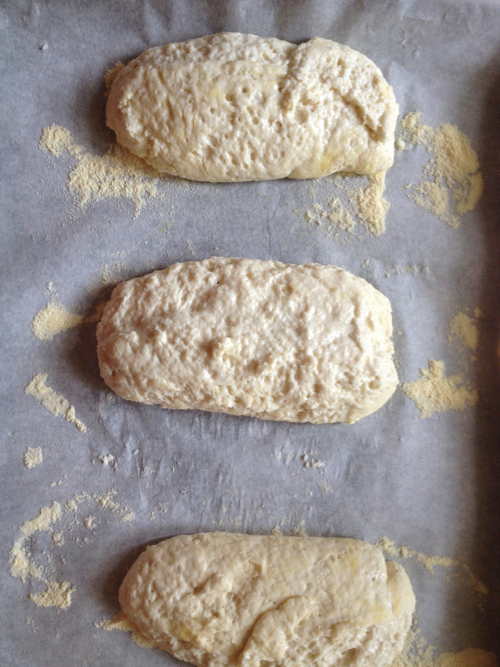 Recently I have started to bake the bread using a baguette tray lined with wet parchment paper. The method is the same as above but I roll the loaves longer and thinner than those depicted in the photos above. Preheat oven to 250 °C (480° F) and place a pizza stone in it. You want to start cooking the bread on a hot surface. If you don’t have a pizza stone use an empty metal cookie sheet or large metal pizza pan (see video). If you need additional time, cover the loaves with a tea towel as explained in the picture and let it rise again 45 minutes to one hour. If I am short of time I skip this step and I bake the loaves directly after forming. Brush the surface with a mixture made with one teaspoon of olive oil and 1/4 teaspoon milk or yogurt. You can also decorate it with sesame or other seeds if you like. If your dough is too wet, the loaves might spread out. Make a note to add 10% less water next time. If this happens however, it’s not a disaster. Just fold them in half along the length, before baking, and roll them carefully in flour. Then brush with oil and milk. 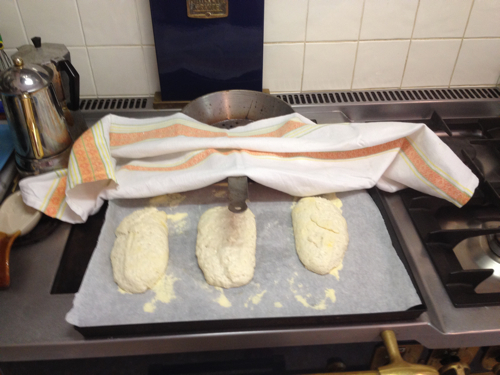 Slide the sheet or baguette tray with the loaves over the hot pizza stone you have previously placed inside to heat up. Add a pan of hot water to steam the oven. Bake for 15 minutes then remove the pan of water. Lower the temperature to 220°C (430°F). Continue baking for additional 30 to 40 minutes, or until light golden all around. The final cooking time also depends on the size of the loaves. please admire the golden crunchy crust! Remove to a rack to cool. Don’t cover it until is completely cool otherwise the crust will become soft. Allow to cool completely before slicing or opening. The bread keeps well for several days without crumbling or falling apart. I slice what I can’t eat in two days, freeze it and then revive it in the toaster when I need it. a gluten free bread to be proud of! In the video below by my favorite Italian GF bloggers you can see how to form the dough on parchment paper and to cook it on a hot surface. Note that they don’t use a poolish in this recipe nor steam the oven. Nevertheless the results are wonderful. Next Post Happy Easter! Happy Spring! Hi Alicia did you already see my recipes for meat and spinach cannelloni and for pancakes cannelloni ? Excellent research. I am not gluten intolerant but I do a real reaction to breads that are over yeasted. I spoke to our local baker recently ( he studied sourdough breadmaking for many years in San Francisco before returning to Australia) and he claimed that a lot of people have bad reactions to over yeasted breads. His breads spent 48 hours rising. The ciabattas I make also have this slow rise time. Good advise regarding yeast. There are many commercial gluten free products out there that use too much sugar also. thank you Francesca. I so agree about sugar. I have tested flour mixes that were as sweet as cake batter, quite awful in a bread. MAss produced bread in my opinion is mostly inedible. It’s made with flour that is often old and has been treated with heaven knows what chemicals to keep it from spoiling. 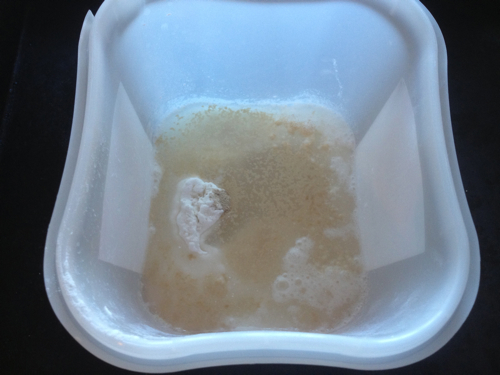 In order to raise it is full of air and yeast but is not properly fermented, so it’s indigestible. Then it’s also added with pure gluten, no wonder so many of us have becoma allergic! Glad to have this. My daughter is highly allergic to gluten so i’m looking for recipes she can eat. Plus, I like GF foods. Nice post! Good luck with it! Cooking GF is quite daunting at the beginning but then it becomes a fact of life and not a big deal. It’s just a matter to get organized and being careful. I now live quite well on a double system. No gluten for me and gluten a few days a week for my family, so everybody is happy! Hi from Canada. is the recipe on this page the same on as in the video? do they use the husks and butter as well? Hi Tom, no my recipe is different from theirs but I use the method of forming the bread that is indicated in the video. Thank you – I tried to find the video recipe online but can’t anywhere. Do you know the cooking times for the bread? Hi Tom, I am not sure if you refer to my recipe or the one in the video. The video refers to a fantastic Italian blog named Un Curoe di Farina Senza Glutine. You find the URL at the beginning of the video. I have linked the video because even if the recipe is slightly different, the method to form the bread is the same I use. The problem with that blog is that the author mostly uses Italian commerciall flours so it’s difficult to reproduce the recipes if you don’t have the same. Did you try to make my recipe above? I am in the process of making the bread today! I found itialian gluten free flour from an itialian supplier here in vancouver. I’ll let you know how it goes! looking forward to learning abut the results! Thanks. 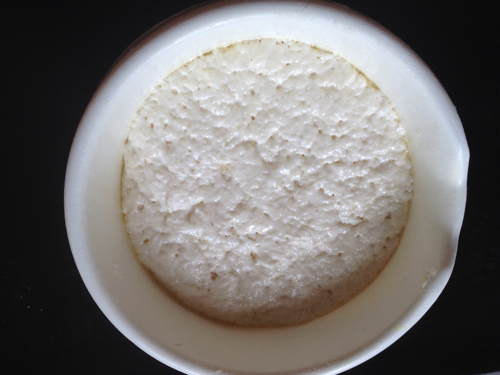 For the yeast, I have been using Mastro Fornaio. Is that what you use? yes Cristina, Mastro Fornaio is perfect! please let me know the results! I am willing to help in exchange of feedback!